I saw this image on Breathe Happiness and it shocked me into a realization. Going to eat the rest of my graduation cake for every meal today because I don’t even CARE. The thing is, the longer I am in recovery, the more I realize that THESE are the two facets to my disease. My disease wasn’t just all bingeing. It was also starvation. It was also exercising so much that I my toenails fell off. Every time I feel like bingeing, that is an indicator that something is wrong in my life. Paradoxically, every time I feel like upping my exercise drastically, that is ALSO an indicator that something is wrong in my life. Every time I feel like changing my calorie goal to a far lower number so I can lose more than one pound a week, that is an ADDITIONAL indicator that something is wrong in my life. It’s never about the food, whether I want to eat ALL of it or NONE of it. It’s never about the running, whether I want to do nothing or ten miles in a day. It’s about WHY I want eat, restrict or exercise too much. I am so grateful that I have finally learned this. When I am tempted to overeat, over-restrict or over-exercise, there is something ELSE going on. Maybe I’m anxious about something. Maybe I’m angry at someone. Maybe I’m resenting something from my past. Maybe I am getting too proud and have forgotten my humility. 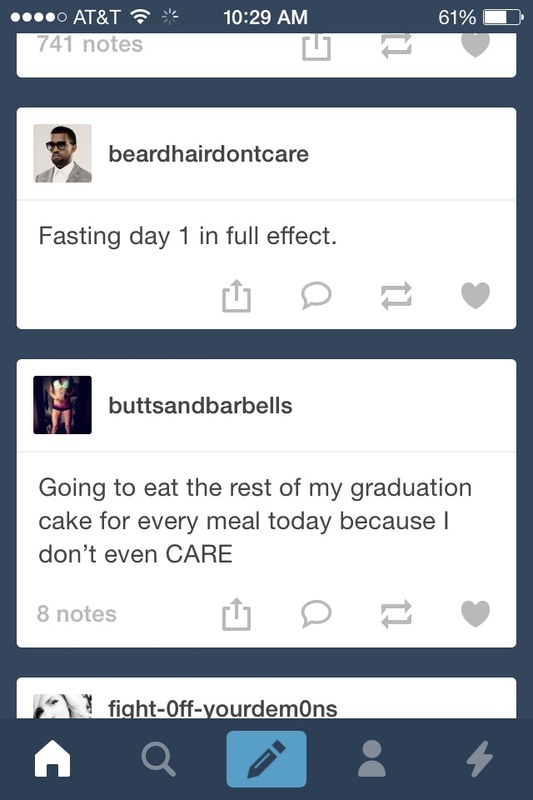 Whatever it is, it’s not about the fasting. It’s not about the graduation cake. These are the two facets of my disease and they are warnings every time they surface in my mind.